An unwary football player collides with a padded goalpost while running at a velocity of 7.50 m/s and comes to a full stop after compressing the padding and his body 0.350 m. (a) What is his deceleration? (b) How long does the collision last? This is College Physics Answers with Shaun Dychko. When the football player collides with the planted goal post, their speed goes from an initial speed of 7.5 meters per second to 0. And, they... their body and the padding compresses by 35 centimeters or .35 meters. And our job here is to find what is the acceleration the football player will experience. 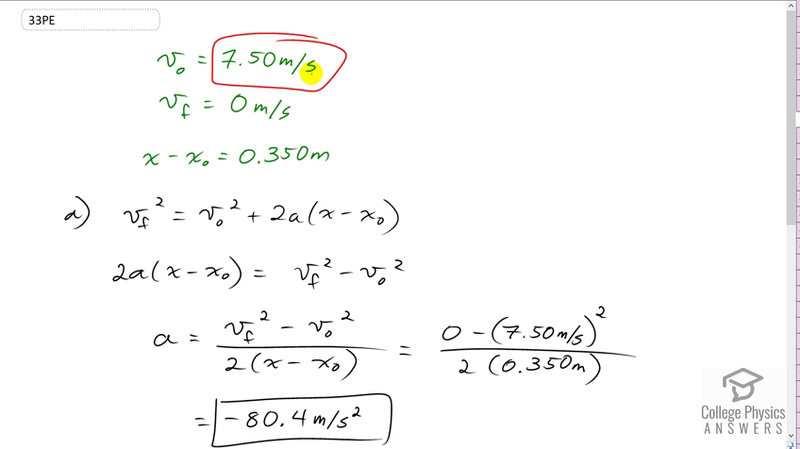 And then in part B, over what time does that acceleration occur. So, we have this formula that contains all of the information that we know plus the only thing we don't know, being the thing we want to find, which is kind of a long winded way of saying it's the right formula to use. You always want to choose a formula that has only one unknown in it and that unknown should be the thing you're trying to find. And we want to find acceleration. And, everything else in this formula that we do know based on information given to us from the question. So, that's what makes this the best formula to use. So, we're going to do some algebra to isolate <i>a</i>. And so, we will subtract <i>v naught</i> squared from both sides. And, switch the sides around as well. So, that gives us 2<i>a</i> times <i>x</i> minus <i>x naught</i> equals <i>v f</i> squared minus <i>v initial</i> squared. And... And then, we will divide both sides by 2 times the displacement. The displacement is <i>x</i> minus <i>x naught</i>. And then, that on the left side isolates <i>a</i>, and on the right hand side, we have the difference of the squares of the velocities divided by 2 times the displacement. So, that's 0, final velocity minus 7.5 meters per second whole squared divided by 2 times .35 meters and that gives us negative 80.4 meters per second squared, as the acceleration. And we know this is negative because it's in the opposite direction to the initially positive velocity. So, the next question is how long does it take to reach a stop. And we'll use this formula which is... one that contains information from the question and only one unknown being the thing we want to find and that is <i>t</i>. We could have used a different formula involving acceleration, but we want to be more cautious by not using a number that we've calculated ourselves because if there's a mistake in this, then that would make the next calculation wrong as well. So, we don't want to use that number if we can avoid it. And we can avoid it because there's this formula. So, the final position equals the initial position plus the average velocity multiplied by time. And, I've substituted here for <i>v bar</i>, average velocity as the arithmetic sum of the final and initial velocities. And divided by 2. And... And then, we can do a bit of algebra here to solve for <i>t</i>. So, let's subtract <i>x naught</i> from both sides and notice with the equal sign here if this is equal to this and that's equal to that. We can... we can ignore this thing. And... and just treat it as an equation of <i>x</i> equals this here. And so... So, we're subtracting <i>x naught</i> from here and then <i>x naught</i> from over here, and switching the sides around. And so, we have the average velocity times time equals the displacement. And then, we will isolate <i>t</i> by multiplying both sides by 2 over <i>v f</i> plus <i>v naught</i>. And then, we have <i>t</i> isolated on the left equaling 2 times displacement divided by the sum of the velocities. So, that's 2 times .35 meters divided by 0 plus 7.5 meters per second. And that gives .0933 seconds or 93 milliseconds. It's the time it takes for the football player to stop.